UFOs are never seen in a cultural vacuum. 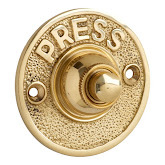 The very terminology we use helps dictate what is seen and/or reported. In the past we had chariots of fire, will o’ the wisps, phantom airships, foo fighters and ghost rockets as some of the main frames of reference for interpreting weird things in the sky. Indeed, the very frame of reference can help cause people to see these things in the sky, or make them report sightings they would never otherwise have thought twice about. A good example of this kind of thinking is displayed in Brian Burden’s article 'The Andreasson Affair and The Time Machine; Was H G Wells an Unwitting Contactee?' (1) Recently, but not altogether surprisingly, Whitley Strieber notes that his fear of abduction by spacemen in the mid-1950s predated any possibility of his having come across such ideas in the media available to him at that time. (2) This blatantly ignores the vast range of science fiction magazines and films then on release in the USA. A brief look at Martin Kottmeyer’s article 'Entirely Unpredisposed' (3) notes the 1953 vintage Invaders from Mars and the 1954 Killers from Space. Other films of that period featuring flying saucers and aliens are The Day the Earth Stood Still (1951), The Thing (1951), It Came from Outer Space (1953), and War of the Worlds (1954), to name but a few! Where did Hollywood get the template for such ideas? Step forward John Keel. He asserts in his typically overstated manner that Ray Palmer’s publication of the Shaver stories in the magazine Amazing Stories in the 1940s supplied the foundation of the UFO myth. (6) Amazing Stories might have exerted a powerful influence, though other factors, such as the Fortean Society and general social conditions, could well have sustained ufology as a subject without Shaver. Indeed, Keel ignores the fact that other countries which did not have such a high exposure to Amazing Stories (if any at all) rapidly took an interest in flying saucers. Many SF-type stories from the distant past, or visionary experiences predating 1947, are littered with religious reflections and interpretations. 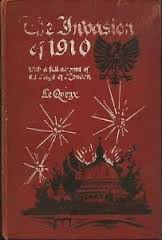 (9) Since the nineteenth century, what we have now come to call science fiction has been overtly secular in outlook, and the same applied to ufology. Yet the writings and ideas in both areas still attempt to address the fundamental issues of why are we here , what is the meaning of life that are usually not very far from, and conditioned by, religious viewpoints. The difference is often only in the use of terminology rather than in a fundamentally different and secular outlook on the world and our universe. (10) With the publication of Whitley Strieber’s Transformation we can see the secular trappings of ufology being stripped away to reveal more clearly than ever the religious yearnings of abductees and contactees. Ufologists have noticed that the phantom airships seen in the USA in 1896-7 and in the USA, Europe and New Zealand during the early years of the twentieth century can be compared with the airships described in the fiction of the period. The question is did the reports inspire the fiction or did the fiction inspire the reports? This question is asked by Iain Johnstone. (11) He puts forward the idea that the phantom airship/scareship panics were caused by the secret experiments of inventors who had created aerial vehicles. Looking at mountains of this material a simple cause-and-effect model cannot be advocated. As ufologists we have tended to look at the phantom airship reports in isolation or, when other factors have been considered, they are used as evidence for the ufonauts’ (or aeronauts’) master plan. Newspapers, magazines, comics, cartoons and plays featured real and fictional aircraft. A new source of influence, particularly on the working classes, was the cinema. British film makers in 1909 borrowed heavily from the popular invasion-scare sub-genre. The image of the airship or aeroplane – especially since both types of aircraft were being constructed and refined with far greater vigour abroad – was a powerful and highly photogenic expression of foreign intrusion – though other wonderful technological weapons were often used alongside or instead of aircraft, such as armoured trains, submarines, battleships, etc. Many of the films had to include a love interest . 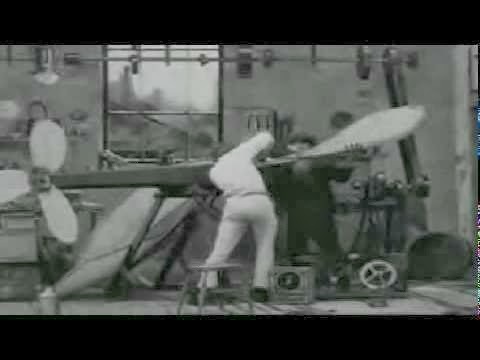 In the case of Walter R Booth’s film The Airship Destroyer, [click on the image above to view a YouTube extract] a young inventor is rejected by his girlfriend’s parents. The destruction of his romantic aspirations is parallelled by the destruction of English aeroplanes and railway lines by an enemy airship. Attacked physically and psychologically, the inventor uses a remote-controlled aerial torpedo to destroy the airship and in consequence gain favour with his girlfriend’s parents. They don’t make narrative closures like that any more! In Percy Stow’s film The Invaders two lovers are finally saved by the Territorial Army. The story begins when soldiers disguised as passengers on a ship land on our shores. They bring with them an artillery gun hidden in a crate (perhaps they should have been going to Iraq?). Once they unpack the gun they shell Dora’s home on a hill. The tranquillity of English domestic life is shattered by this untimely and obviously unwanted intrusion into their little home. Dora’s lover is blasted and knocked unconscious by the weapon’s onslaught. Fortunately Dora sends a note by pigeon to the Army that in the nick of time saves them from the foreign hordes. Leon Stormont’s treatment of an invasion in England Invaded was more unusual because it included fictional and factual film segments as well as live action, songs and recitation. It opened at London’s Coliseum Theatre on 22 February 1909 and went on tour later in the year. The interest in airships caused by the scareship panic in the early part of 1913 brought about the production of a play called Sealed Orders. This was presented at the Theatre Royal, Drury Lane, London from 11 September 1913. Cecil Raleigh and Henry Hamilton’s play has more twists than a political manifesto. It involves a man who is friendly with a foreign diplomat. They blackmail an admiral’s wife to obtain some important sealed orders. The man gets the orders and takes his daughter to a waiting airship. The plan is to use the airship to deliver the orders to the man’s foreign contacts. The scheme is foiled when the spy finds that the pilot of the airship is an old adversary. They fight and fall to their deaths. The daughter is rescued by the Royal Navy, and the orders are saved. Stolen plans and papers featured prominently in England’s Menace and Wake Up!, both released after the declaration of war in August 1914. In the first, directed by Harold Shore, a daughter of a lord discovers discarded wireless messages carelessly left by a foreign spy. One of them reports that an enemy fleet is sailing towards England. She immediately dashes to 10 Downing Street, whereupon the Prime Minister mobilises the army and navy. Using a radio and the enemy’s secret code he orders their fleet to return. War is averted due to the quick-witted action of the young woman. In Wake Up! the Secretary of State for War is all for compromise and playing golf. When war does come his daughter helps recover the plans for the defence of the eastern coastline from the hands of the enemy. From this brief survey we can see that even poorly read members of the working class would be aware of the threat of Germany and would, through film shows, posters, cartoons, etc., be aware of the appearance of aeroplanes and airships. Perhaps one reason why so many of the phantom airship sightings during the British 1909 and 1913 scares were made in cities was the greater exposure of the urban public to the cinema. Though it should be added that most airship reports detailed in the newspapers were made by middle-class male witnesses – the visions of workers and women were not given so much attention, or were briefly mentioned to back up the prime witnesses’ sightings. 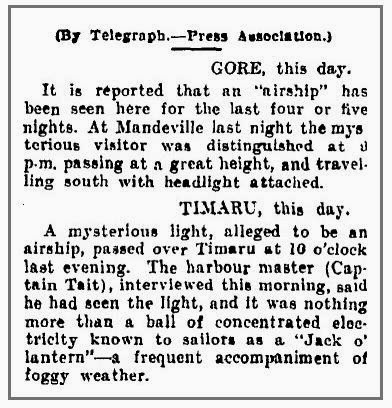 This evidence might suggest that there was a real airship flying over New Zealand at that time. The eyewitnesses agree that the thing was boat-shaped, carried two pilots and had a mast-like structure on top of it. The problem with such an idea is that when a reporter finally went to see the original witnesses to the Kelso manifestation their story was different. They had not seen a mast-like structure or two pilots. The children, and one adult, who saw the craft were asked to make drawings of what they saw. The resulting illustrations look nothing like boat-shaped aerial vehicles. Apparently the original Kelso report was made by a local correspondent who had half-guessed what the children had seen. In some quarters it was felt that the children’s drawings had been influenced by what an airship should look like from a recent copy of the Windsor Magazine. Elsewhere it was noted that a children’s comic called Chums had featured an airship story titled 'The Peril of the Motherland' . What makes the whole Kelso affair even more intriguing is that in 1966 the Otago Daily Times tracked down the original witnesses. They make the waters even more murky. Agnes Falconer, who had been prominently featured in the 1909 accounts and had one of her drawings of the airship reproduced in several newspapers, now said she hadn’t seen anything. Plus, she said, I’m very positive I didn’t draw anything. I can remember the reporter coming to school, but I wasn’t in the class he interviewed… There were a lot of rumours. It created a big stir at the time, but whether there was anything in it, I really don’t know. None of the other witnesses were willing to say the whole incident was a hoax; on the other hand, none of them gave much credence to the sightings. George McDuff, who saw an airship over Kelso on 24 July 1909, said, The children had been reading certain magazine articles (describing an airship) and daydreaming. I put it down largely to that. Are phantom airships, UFOs and the like all daydreams trying to become reality? Does fiction and/or our thoughts about, combined with social circumstances, produce the very things in the sky we expect to see? I don’t think there are such things as flying saucers but we have had to invent them – they are eloquent expressions of our inarticulate wonder and angst at our tinkering with nature. See for example the reported experience of Charles Woodward recorded in WATSON, Nigel; 'Green Monsters', Folklore Frontiers, No. 9, 1989. Jimmy Goddard notes further parallels between this case and Christian imagery in the following issue of Folklore Frontiers. This kind of religious connection is put more forcefully by John Paul Oswald (in a commentary privately circulated in May 1990) who asserts that we must acknowledge the reality of God, that Jesus is our teacher and saviour, and that in harmonious unity with them: We have the UFO-Aliens in their role as the operative agents of Christ’s installment for overt control. In other words the UFO-Aliens are paving the way for the Second Coming predicted in the Book of Revelations. This isn’t a new idea amongst UFO contactees, but with the ending of the century we can surely expect much more of this thinking within mainstream ufology.